This budget security camera is much more effective than the low price-tag suggests. The camera links up to an app on your smartphone, allowing you to check on the outside of your property at any time. You can activate motion sensor alerts while you’re out, which will send a notification to your phone so you can view what’s going on from anywhere. You can choose what to do next – record what’s happening, use the microphone and speakers to talk, or activate the sirens and strobe lighting. This camera is the perfect companion to the mini indoor home camera we also offer – both work with the same app, so you can cover your home both indoors and out. We’re offering the outdoor camera for just 169€ (inc IVA) for a limited time only. 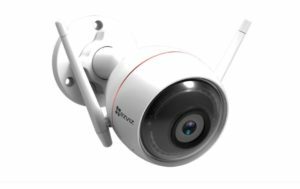 If you’d like to know more about this, or our indoor Mini camera, please email us on sales@telitec.net, or call 965 743 473 / 902 889 070. We’re happy to post products to you in Spain, or you can pop into our Moraira office if you’re nearby.